Next time your pooch is pantin' for a drink, pull out the convenient, collapsible Chuckit!® Hydro Bowl. Folds up and snaps into a compact size. 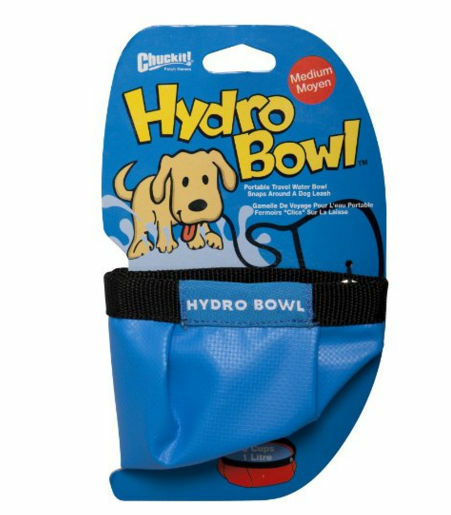 The Hydro Bowl provides a convenient means of hydration for your dog. Easy to clean. 5 cup capacity. Waterproof and made of a high-tech, durable plastic canvas. The Hydro Bowl folds up and snaps closed into a compact triangle for storage. Handy snap to attach it to a leash, backpack, bicycle, or a variety of other places for easy storage.